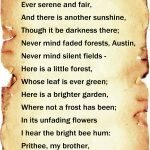 One of the most celebrated poets in the US, Robert Frost holds a unique position in American literature. He was awarded Pulitzer Prize four times – the result that no other man of letters has managed to achieve so far. It was partly due to his long and fruitful life (he died at the age of 88), but what actually mattered was his talent. From a formal point of view, his poems follow the rules of metrical verse. What make them unique are the reflections concerning New England, its nature and all those things that unite people living there. However, the matter of uttermost importance for the author was philosophy, namely the essential and universal problems of human existence. At first glance, “Nothing gold can stay” seems just another poem about autumnal nature. Yet even the rather common metaphor comparing fall to the decline of human life is not a chance one, it conveys a personal message. This message is connected with Frost’s own life. During his long life the poet went through a series of losses: he lost his wife, whom he loved dearly, as well as his four children. Frost’s son decided to take his own life when the Second World War started. Being aware of these facts you become capable of feeling all the tragedy behind the words “Nothing gold can stay”. The line “Nothing gold can stay” could be considered a response to Shakespeare’s Sonnet 65. Or who his spoil of beauty can forbid?”. Robert Frost is universally accepted as America’s national poet and the world’s greatest poet of the 20th century. Why not any other talented poet (there were a lot of them in the previous century)? Why not any other man of letters who wrote about philosophical problems connected with the everyday life? Time gives the answers to all these questions. 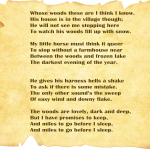 The thorough research of Robert Frost’s poetry reveals a whole lot of new messages. Similar to Walt Whitman, he alluded to the Bible and to classic literature. Yet he named mowing and chopping wood among the things he loved to do, in addition to writing poems. He called his poetry a dream, creating the future. Neither contemplating nor prophesying, but creating. And yet the author writes: “So Eden sank to grief”. This line is connected with his biography. His first marriage was not easy: initially, the woman he loved did not accept his marriage proposal (and this even led him to a suicide attempt), their first baby died. The woman with whom he fell in love with late in his life, refused to marry him, as she was married and loved her husband.